Everything you need to know about setting up templates in Process Bliss. To get started with Process Bliss, the first thing to consider is creating a template. Templates are the blueprints for the way you perform certain activities in your business. They contain the steps and all the information you need to complete the activity. When the activity needs to be performed, you create a task from the template and start completing the steps. This saves you a great deal of time, especially if the activity is performed on a regular basis, as you don’t have to remember all the steps and you are less likely to forget something important. In this video, we show you how to set up your first template in Process Bliss. Select ‘Templates’ at the top left of the page and select your organisation (if you have more than one). Here you will be able to either ‘Create template’ or 'Create folder’. Folders are a good way to organise your templates to keep track of them. Select ‘Create template’ to get started, and enter the template name. The main part of a template is adding the individual steps that require completion for the process to be successful. To add your first step, all you need to do is click the step button on the left hand side of the screen, or under the purple header bar. One of the great features Process Bliss has added to each individual step is the ability to make each step either optional or essential. When completing steps such as confirming the budget and writing the job description, these steps must be made essential as otherwise the process as a whole would not work. Whereas for steps such as advertising the job in a newspaper or online, these may be unnecessary and therefore optional. For a task to be completed, only the steps labelled as essential must be completed. However, when using the template to make a task, all of this can be amended depending on the circumstances at hand. You can either click the step button to the left hand side of the screen, or the 'Add a step' link under the last step, and a new step will be created. When you have a step open, you can just click enter to create the next step very quickly and efficiently. 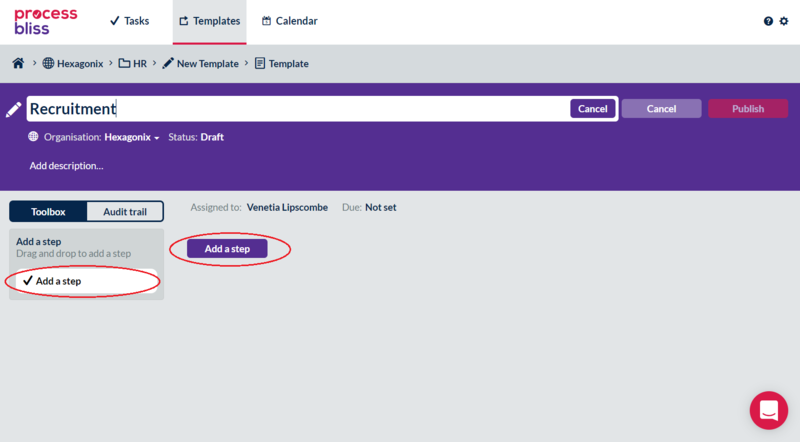 You can also drag and drop the add step button to make associated steps or add your next step so that some steps are connected together. This might be useful for a step such as 'advertise' which could have 'advertise in newspaper' or 'advertise on website' as sub-steps. 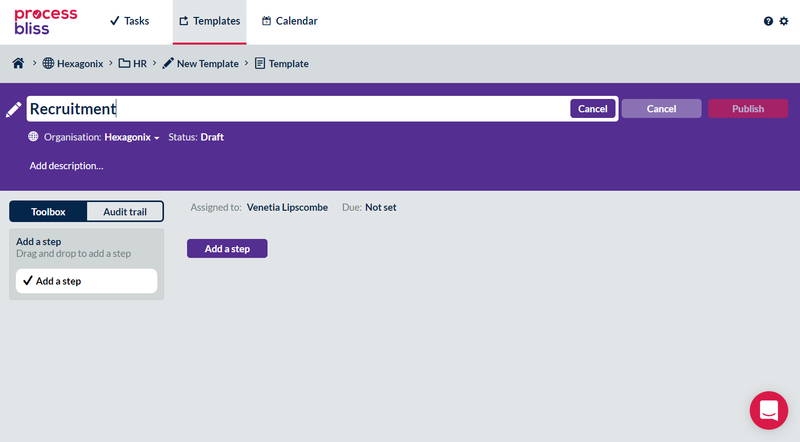 When you have finished, make sure to select ‘Publish’ to save the template in your Process Bliss account. Once a template has been created it can be used over and over again to create tasks. This is ideal for tasks that you carry out regularly. What is the difference between a task and a template?